I am an avid reader of design and advertising books. As geeky as it sounds, I read those types of books as my pleasure reading. I always want to know more about how to excel at my craft. Every so often there comes along a book that completely changes the way that I think about advertising and marketing and About Face is one of them. Dan goes into great detail about how we truly react to advertising and it’s not in the cognitive areas in the brain. In fact, the cognitive area (where language resides) may actually lie to us to protect our self-image…you know the people who say they watch public television to sound smart, but they really can’t stand it? There is a part of our brains that has no language but controls our emotions. 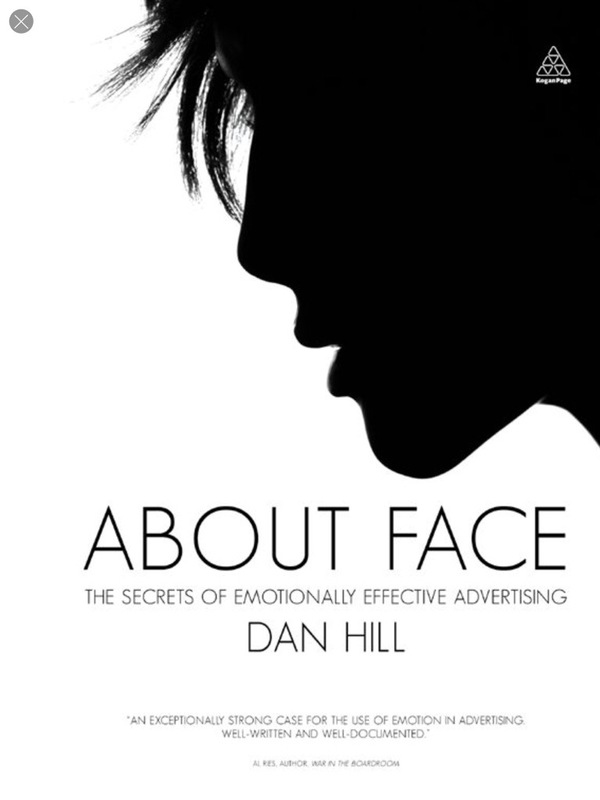 Dan and his team have found a way to learn what we’re really thinking about ads by examining our facial expressions. We all do it. There are micro-expressions that last a fraction of a second that show our true feelings about what we are viewing. An example that Dan uses in the book helped lead to the Dove “Real Beauty” commercials, that showed women of varying shapes celebrated by the skin care company. When the original video was shown to the target market, they scowled at the skinny models in their undies. “I don’t look like that, so this product can’t be for me” they thought and their expressions belied those sentiments. Through his research, Dan Hill and his team can tell us which type of advertising resonates most with people, how the same types of advertising win awards, and just how easily influenced we can be by our environment. 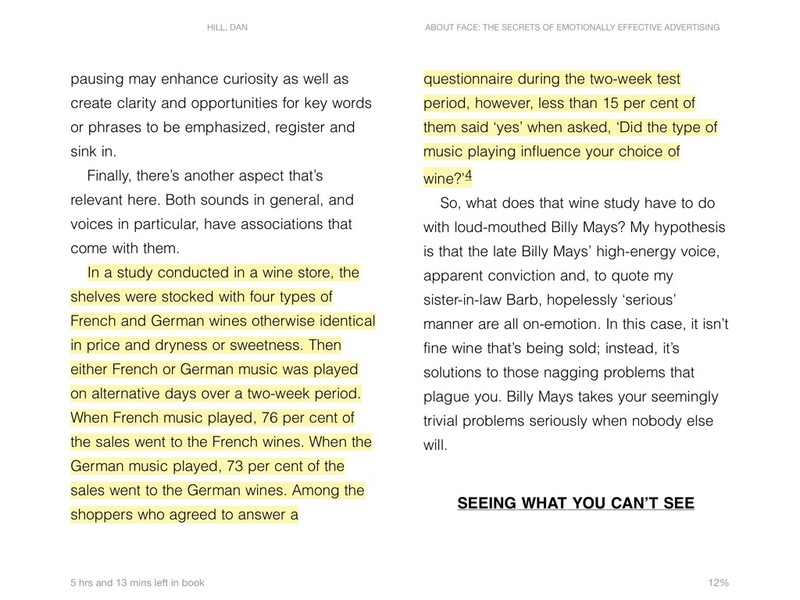 The photo below is a passage about how changing the music in a wine store influences our purchases and how brands can engage senses other than sight to influence our behavior. Have you noticed how Hilton Hotels offer freshly-baked cookies when you check in? There’s a science to that. Without getting too long-winded, this is a must-have reference for anyone who is serious about making advertising that motivates and memorized.